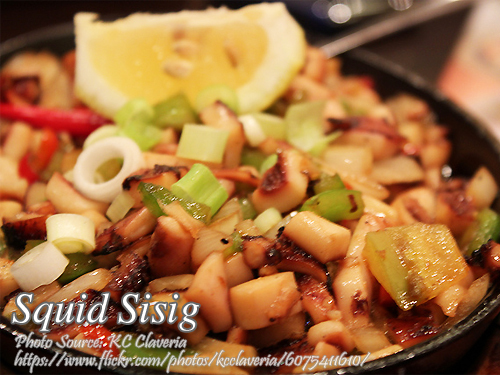 Squid sisig is another version of the famous sisig aside from the pork, fish or chicken sisig. Sisig has become so popular that there are many version of sisig that are created. Making squid sisig is not hard as you might think. Since squid is easy to cook, it is simple enough to prepare. The only tedious task is cleaning the squid and removing the innards and grilling them. In grilling the squid, you can omit marinating step by just rubbing it with salt. But I guarantee that is will taste more savory if you will marinate it with 7-up, calamansi juice and salt before grilling it. Marinating it will also make the squid tender and juicy compared to just grilling it without the marinade. Just don’t overcook the squid because it will become rubbery and tough. Wash and clean the squid by removing the innards, ink sac, beak, skin and the transparent squid bone. In bowl, combine 7-up, calamansi juice and salt. Mix the marinade and add in the squid. Marinate for at least 3 hours then grill for at least 3 minutes on each sides. After grilling, let it cool. Chop the squid into small pieces then set aside. Heat oil in a pan and saute the garlic, onion, green chilies and ginger. Add in the squid and saute for a minute and mix well with the spices. Add in the liver spread, liquid seasoning, bell peppers and soy sauce. Saute for another 3 minutes. Add the squid sisig in the heated sizzling plate and garnish with fried egg and chopped spring onions. Put in a wooden tray and serve hot.